It looks like everyone is still going balmy for beauty balms. I am definitely a convert. I have stopped stripping my skin with strong makeup removers and replaced them with oils and balms which are usually made with natural and organic ingredients. A good beauty balm will easily remove stubborn eye makeup which I always have, so any brand that doesn’t, will never make it into my bathroom cabinet. I have been obsessed with Neal’s Yard because I am inspired by their ethical and organic ethos. As I am now trying to take my beauty journey towards a more sustainable route, I wanted to start with a brand that is not only ethical, but luxurious too. 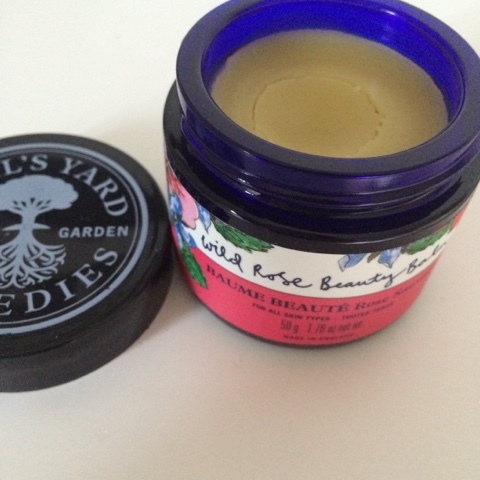 As a Neal’s Yard Virgin, I started with the Wild Rose Beauty Balm which is one of their hero products. Too be honest, it was the packaging that got me – the design by illustrator Alice Shields was originally limited edition, but it was loved so much, it is now back by popular demand. I’m so happy about this because its amazing! 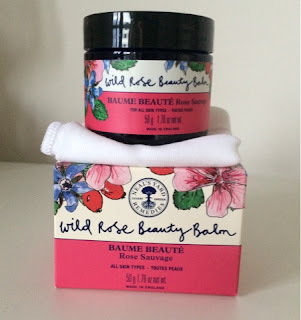 The Wild Rose Beauty Balm is a potent antioxidant proven to help repair, firm and sooth skin. It contains exceptionally high levels of my favourite ingredient – Rosehip oil, known for its healing, and anti inflammatory qualities, combined with Geranium, Starflower, Hemp, and Rosemary oil – seriously, the ingredients in this stuff is what every hippie’s dreams are made of! This award winning balm helps to nurture, decongest, enrich, and restore radiance. It can be used as a rich cleanser, gentle exfoliant or deeply nourishing balm. 1. As a regular balm where you run onto skin, removing makeup and using the hot organic muslin cloth (which comes with the balm) to remove. Rinse with warm water and pat dry. 2. As an exfoliant. Applying a thin coat of the balm as above, and use the hot muslin cloth to wipe away using gentle circular movements. 3. The full treatment – Massage into the skin according to the instruction manual, cover with the hot muslin cloth, and leave over night. The first time I used this mask my skin was in a really bad way. I had just come back from holiday so my face was slightly burnt, dry, and lacked moisture. I was stressed and tired too. I applied the balm, and went straight into routine 3. The balm is hard to touch but melts onto skin really well. It smells amazing and natural so those who are used to highly perfumed beauty products wouldn’t like it. 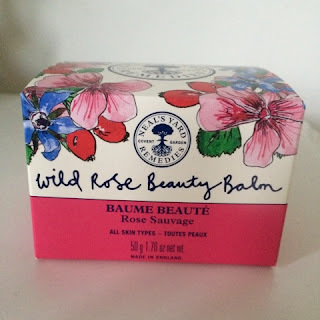 The balm has a strong scent of rose but nothing like the rose your grandma wore – this stuff is potent. It feels really nourishing on the skin and it makes the massaging really easy. I didn’t really have time to follow the massage instructions on the leaflet so I did what felt good to me. I applied the hot cloth, exfoliated (step 2) rinsed, and then applied a thin layer and went to bed. When I woke up, my skin was like new. This stuff is unreal! It was glowing, soft, smooth, and its was glowing. I have been using the balm twice a week. I applied the balm only one night, and today, I did step 2 and then left it on while I had a shower. Apologies to Neal’s Yard for not following their system, but I guess with all products, you find your own unique way of using them. Available from Neal’s Yard and stores Nationwide.